When the motor yacht Gwynreta leaved Scarborough Harbour on Sunday for Copenhagen, Esbjerg, Aarhus and other Scandinavian ports, it will have on board a full selection of the latest export designs of John Holdsworth & Co Ltd, moquette manufacturers, Shaw Lodge Mills, Halifax. Mr. William Holdsworth, principal of the firm, is the owner of the yacht. He conceived the idea of taking his firm's products abroad personally after a business visit to Scandinavian countries in 1949. Mr. Fred Farrar, the firm's secretary told the Yorkshire Post yesterday that Mr. Holdsworth, a former R.A.F. officer, was keen on promoting their export trade. Hitherto the business has been concerned primarily with the home market. Recently, however, the firm has accepted contracts from the Finnish State Railways and from a new university and civic theatre in Helsinki. Finland is not listed in the itinerary, but Denmark, Norway, Sweden and Germany are to be visited. Mr. Holdsworth's wife, who is of Dutch parentage, will travel with him. A director of the firm, she will be of great assistance to the expedition as she speaks fluent German. The voyage is expected to last five or six weeks. The Gwynreta, 26 tons, was built in 1945 for service as a torpedo recovery launch in the East, and is 60ft. in length. She was never on active service and was bought by Mr. Holdsworth last September. In September and October Mr. Holdsworth took her for a trip round the English and Scottish coast and had only two fine days, at Torquay. With a speed of 12 knots, she has triple screws and is fitted with an awning for hot weather. A civic welcome was given by the Mayor and Town Council of Esjberg, Denmark, to a Halifax business man. 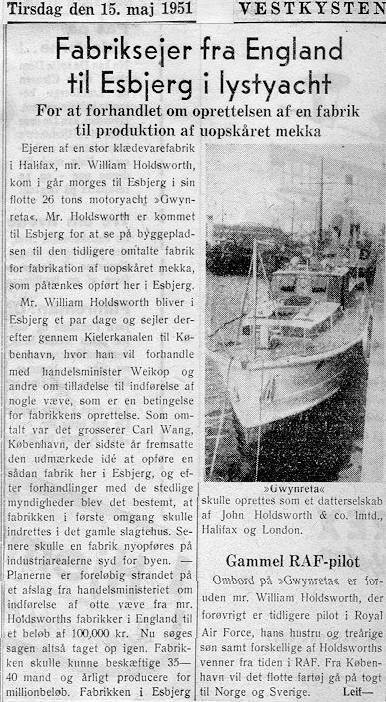 Mr. William Holdsworth, who arrived there in his motor yacht Gwynreta with a display of his firm's latest export designs in furnishing fabrics. Mr. Holdsworth, managing director of John Holdsworth & Co Ltd, moquette manufacturers, Shaw Lodge Mills, Halifax, is visiting customers and agents in Denmark. He sailed from Scarborough on Whit Saturday for Esbjerg, and has since visited Sylt, in the Frisian Islands, Cuxhaven, Luebeck (via the Kiel canal) and Frederica, on Denmark's Baltic coast. 12 June 1951 in The Halifax Daily Courier & Guardian - King said "Carry on"